Nearly anyone who owns an oven knows Jamie Oliver. What you might not know is that the eternally boyish, incredibly successful celebrity chef is enjoying newfound health and happiness thanks to some simple, but profound, life changes. It’s holiday time. You’d think sugar plums are dancing in people’s heads, but Jamie Oliver’s recent release bent on inspiring people to prepare healthier foods is a blockbuster. In fact, Oliver’s new book Everyday Super Food has just knocked “The Great British Bake Off” right off the top of the charts for holiday cookbooks in the UK — for the first time in three years. With his initiatives to help employ disadvantaged youth, his mission to educate and advocate to battle childhood obesity, and of course, his amazing recipes, we at Withings were already super fans of the super chef before learning he uses most of our connected devices. Finding out Oliver was a Withings fan? Well that, as we say, was just icing on the gluten-free apple Christmas cake. Get to know how he got healthy, what he geeks out on and more in this exclusive interview. Withings: You were an instant hit in 1999 with The Naked Chef, yet your 2005 documentary series on school meals in Britain was the first television program you did that was focused squarely on the health aspects of food. You have since done numerous series and books about educating people on how to eat healthier. What was the moment you decided to focus on the health of food, and not just the preparation? Was there a turning point? 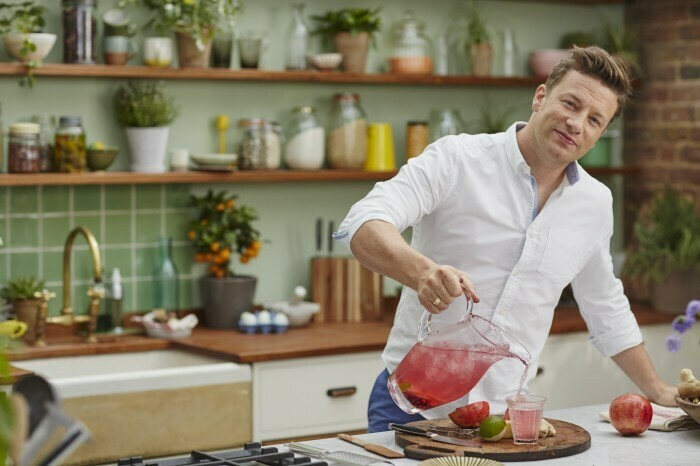 Jamie Oliver: I think the real turning point was becoming a father for the first time. That was around the same time we opened the Fifteen restaurants in London – still going strong after all these years – and so the TV series after the last Naked Chef series was ‘Jamie’s Kitchen’ — all about opening Fifteen. After that, my focus was still on food and travel and discovering new cuisines but the education stuff was also huge for me. School dinners came about really because I started thinking about what my kids would be eating when they went to school; the more I looked into it, the more horrified I was. When we started filming in the UK, there were more regulations for dog food than there were for school food. Many articles have touted your recent weight loss and said that wearing an activity monitor was what helped propel you toward better health, specifically the sleep-tracking feature. Can you explain? I was surviving on around three hours sleep a night for the last ten years and I just didn’t realize how important it was. Tracking that and making it a priority along with filling my body with better things and moving more meant I just felt so much better. Once you are aware of things and can identify them its makes it much easier to tackle. Nutrition and activity are exciting pursuits covered by cooking shows and big competitions. We also believe that sleep is an incredibly important, and an often overlooked, aspect of health. As getting rest is, by necessity, a silent and solitary pursuit, how do you think you can help pioneer a “sleep movement”? In your recent documentary Jamie’s Sugar Rush, you explore the negative impact sugar is having on world health and propose changes government could make to alert people to these issues. In your own world, with four children, do you find limiting sugar a challenge? Are you or your wife always seen as “the bad guy” on this issue? If I’m honest, it’s never been a big problem because we’ve never had sweetened fizzy drinks in the house and we’ve never had loads of sweets hanging around. Our kids are pretty clued up when it comes to treats – and don’t get me wrong, I love a good cake as long as it’s home-made, and I love a dessert as a treat in a restaurant if I’m out. The problems come when people are overloading on sugar every day, and in the UK our kids are too often hydrating on sugary sweetened drinks or even those energy drinks – I’ve seen those in the lunchboxes of primary school kids and it’s basically impossible to teach a kid who’s wired on energy drinks. Your new book, Everyday Super Food, contains recipes that helped you get healthy. Which of those foods or recipes do you find yourself going to the most? It’s an impossible question to answer because it depends on the season or what I’ve got in the kitchen. What I would say is that my food intake has changed over the last year or so. I’m eating much more vegetarian food – I’m probably veggie three times a week – and I’ve cut down on my red meat, although I could never give it up completely. Last year, you published Jamie’s Comfort Foods, a beautiful book filled with recipes under chapter titles like “Guilty Pleasures” and “Sweet Indulgences.” Now that you are on a health kick, are these treats totally off the menu for you? Not at all. For me, comfort food is for weekends, when you’ve got a bit of spare time to cook and put a bit of love into it. During the week I’m basically eating a healthy, nutritious diet and on the weekends I’m easing off a bit. That’s not to say that I’m making lobster mac & cheese every Sunday, but I’m definitely keeping the treats for Saturday/Sunday. We read that you are a “self-confessed geek” who has tried out many brands that offer technology for tracking health and fitness. Which Withings device do you enjoy using the most? Withings Home is amazing. I have them in my kids’ rooms and get notifications on my phone when there is movement so I can check in a see them and talk to them. Its brilliant when I am away travelling — Buddy loves it when I talk to him!